Anytime someone breaks in somewhere to steal or commit a felony, that’s a burglary. 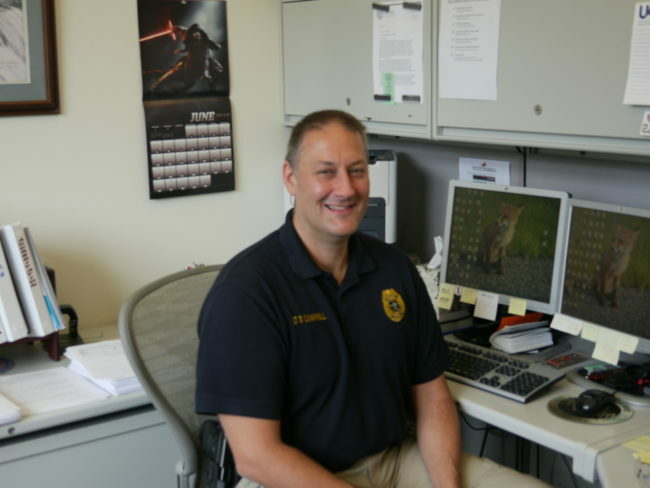 It’s a crime of opportunity that can affect anyone, said Juneau police Lt. David Campbell. “What I see a lot of is people who are not exposed to crime, and they live in Juneau and think it’s a little crime-free utopia, and they make it very easy for an opportunistic thief to victimize them. They don’t lock their houses. They leave their cars unlocked,” Campbell said. Campbell sits at his office computer reviewing the history of burglary in Juneau. JPD has seen a dramatic rise in burglaries in 2015 and, so far, this year the trend is continuing. Victims of break-ins have lost everything from inexpensive belongings to thousands of dollars in valuables. Juneau Police say drug addiction is driving part of the increase. “So overall, in Juneau, we had basically three years of pretty solid reductions going down and then in 2015, we had a pretty sharp increase,” Campbell said. JPD’s annual stats for 2015 show reported burglaries increased by 66 cases. It’s an increase of 64 percent. Campbell sees a definite correlation between heroin use and other crimes. He said addicts sometimes resort to crime to pay for their addiction. “But, it would be inappropriate for me to say that’s the sole reason,” Campbell said. He said JPD has also seen serial burglars, who don’t have a drug problem but repeatedly steal for other reasons. Simply put, he can’t identify every factor contributing to Juneau’s spike in burglaries, and it’s impossible to say who all the burglars are. They cross all sectors of the community. “What I can pretty much guarantee you is that if someone is a burglar, they’re not going to burgle one place and then stop,” Campbell said. Campbell said most burglars will continue breaking into places until they are arrested or something else stops them, so property owners need to make their properties too risky to target. “If somebody really wants to break into your house, or your business, stopping them will be very, very difficult. But, you can make it to the point where, when that really low level cost-benefit analysis happens, the person will choose to go somewhere else as opposed to victimizing you,” he said. “How do you design places so it sends the subconscious message to people that this is not the place that you want to commit a crime in? It’s not just burglary, it could be any crime. We’re talking about natural lighting, lines of surveillance (and) things along those lines,” Campbell said. He said JPD has posted advice for small business owners on its Facebook page. Suggestions like emptying your cash register and leaving it open and visible to people passing by the front of the store. “If a thief walks by or a burglar walks by, they’re going to think, ‘Wow, if I go into this place, anybody on the outside is going to see me in there because there’s easy viewing access through the windows and why would I go in there? The cash register is open, there’s nothing in it,’” Campbell explained. He said people can also try “target hardening”: installing stronger locks, and security systems. According to JPD’s annual report the department cleared roughly 47 of the 169 burglary cases it investigated in 2015. That’s a higher clearance rate than the national average in 2014. Campbell said property crimes are generally much harder to clear, because most of the time police are dealing with people who don’t know each other. The report also said the number of vehicle thefts and thefts in general also rose significantly in 2015.